These Raw Neapolitan Overnight Oats from The Abundance Diet by Somer McCowan can make a lovely morning presentation, and they truly tastes like dessert. Make sure to plan in advance for this meal since you will need to start preparation the night before. This breakfast can make a lovely morning presentation, and it truly tastes like a dessert. Make sure to plan in advance for this meal since you will need to start preparation the night before. The night before you plan on making this, blend the oats in a blender or grind them in a coffee grinder until fine. Transfer half of the ground oats into each of two quart-sized mason jars. Into each jar, add 2 tablespoons chia seeds, 1 1/2 cups almond milk, and 2 tablespoons date paste. Add the raw cacao powder to one of the jars and the vanilla extract to the other jar. Put lids on the mason jars and shake until the ingredients are well combined. Now you have one jar of chocolate overnight oats and one jar of vanilla overnight oats. Put the jars of overnight oats in the refrigerator and leave them overnight. The next morning, blend the frozen bananas in your food processor with a splash or two of almond milk. Process until creamy. Remove half of the mixture and set aside in the freezer. Add the frozen strawberries to the banana mixture remaining in the food processor and process the same way. Now you have raw strawberry and banana ice creams. 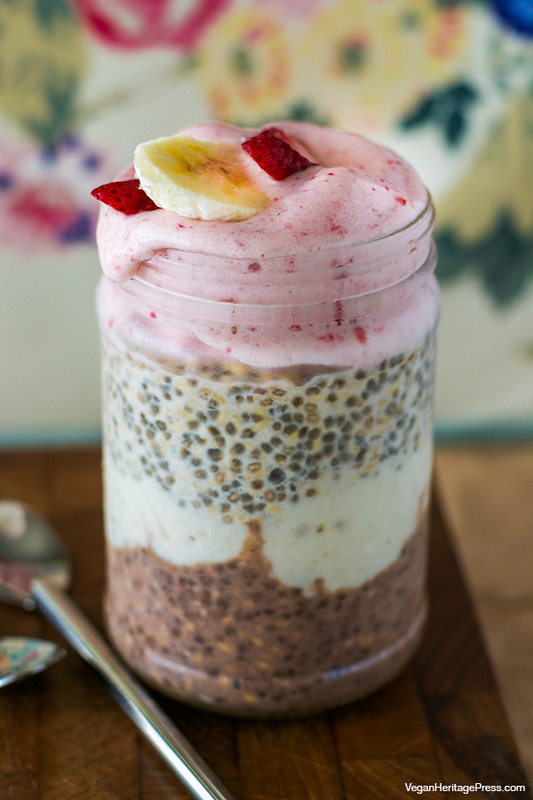 Layer and alternate the banana and strawberry ice creams with the chocolate and vanilla overnight oats in clean mason jars or fancy clear glass serving cups as in the photograph. Serve immediately. 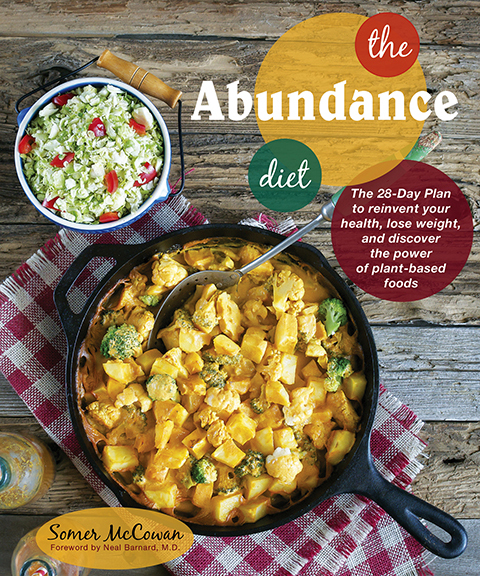 Recipe from The Abundance Diet, © 2015 by Somer McCowan. Photo by Ann Oliverio. 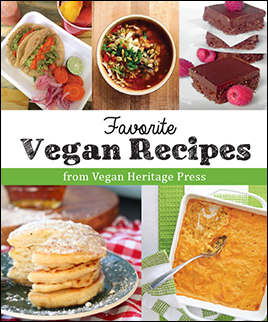 Used by permission from Vegan Heritage Press LLC.